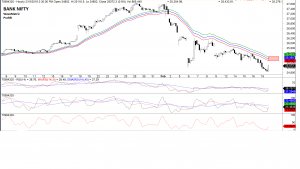 BankNifty – RSI compress signal was formed on the Bank Nifty index followed by the move up in the last hour. The hourly candle ended as a bullish engulfing candle, displaying short term strength. Bank Nifty can move up to 25270 – 25430 levels. A big resistance zone awaits the index there. Price action needs to be considered at those levels to device a strategy to trade Bank Nifty, if the said levels acts as resistance and repel the price back then Bank Nifty may likely test 24620 – 24360 levels. In short a short term strength may be witnessed in the index for a day or two, which may push Bank Nifty to 25270 – 25430 levels. Shorts can take off some positions, while swing traders may take a counter trend opportunity to go long. Fresh shorts is not recommended at these levels. Note this analysis is done on a hourly chart. Our previous analysis on Bank Nifty is still holding good.